Why Isn't Lag B'Omer So Special Outside of Israel? Some years ago my daughter asked, "Why is Lag B'Omer here in America nothing so special (except for us, we make a bonfire Lag B'Omer night)? So fine, you can get a haircut, buy a dress, whatever (community picnic, baseball game in yeshiva for my brothers). And yes, many Chabad houses make a Lag B'Omer parade (which is a pretty big deal in Crown Heights, headquaters of Chabad.) 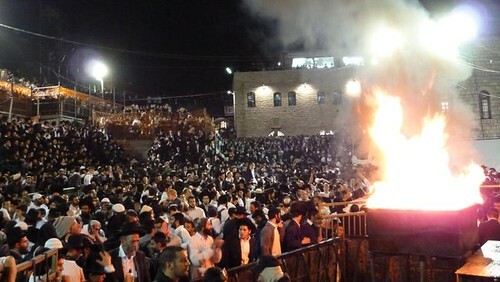 But in Eretz Yisroel (Israel), hundreds of thousands celebrate in Meron by the kever (tomb) of Rabbi Shimon bar Yochai and everyone (even the secular) make a bonfire. There's massive achdus (unity), everyone joins a bonfire, and Meron is celebrating 24 hours!" My dear daughter, when we say that Eretz Yisroel, the land of Israel, is Eretz HaKodesh, the Holy Land, what do think that means? It can't mean that there are more synagogues, if you go to Boro Park in New York City, or Williamsburg, or Crown Heights, Monsey, Lakewood NJ, Passaic NJ, there's just as many. There's just as many kosher stores, the food has the same level of kosher stringencies. There's just as many Torah lessons going on, and as many children in yeshivas. If you travel to Meron on Lag B'Omer, or to the holy gravesites in Tzfat (Safed), or the kever of Rabbi Meir Baal HaNes in Teveria (Tiberious), or aveninu Shimon ben Yaakov Aveniu, or any of the holy gravesites of the tzaddikim, prophets, forefathers and foremothers if Israel and the Jewish people, you'll find a great concentration of chassidim, litvishim, mizrachi, a cross section of religious Jews and even a reasonable quantity of less religious observant and even secular Jews. If you go to those same Jewish groups in America and discuss kivrei tzaddikim, holy gravesites of our holy ancestors, they'll look at you sideways like you're weird or even possibly in to some kind of avodah zarah (idol worship) - with the exception of chassidim and the gravesite of their rebbe. The answer is related to the tzimtzumim, the contractions and filters that separate this world from the Ein Sof HaKodesh and the Or Ein Sof, the Blessed Infinite One and His Infinite Light and allow us to perceive ourselves as independent beings, meaning the creation of free will. There's a little less filtering in Eretz HaKodesh, in the Holy Land, a little more spiritual light, a little more closeness to Hashem, leaks through. You can't see it, but you can see people reacting to it. Spirituality is just a little more spiritual, discussions of G-d and His Torah are a little more real, a little more alive. The neshama, the soul, gets a little more excited. You can't see the spiritual, but you can see it's impact...if you're looking.